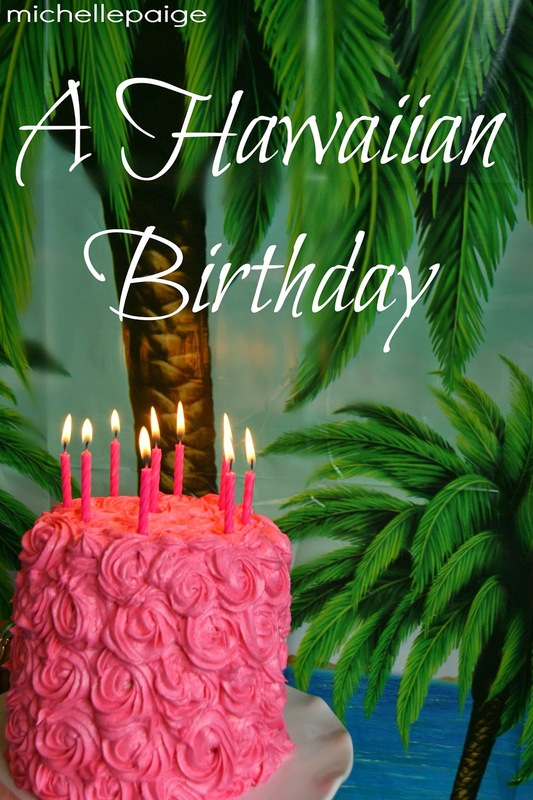 It's a Hawaiian Birthday Party! 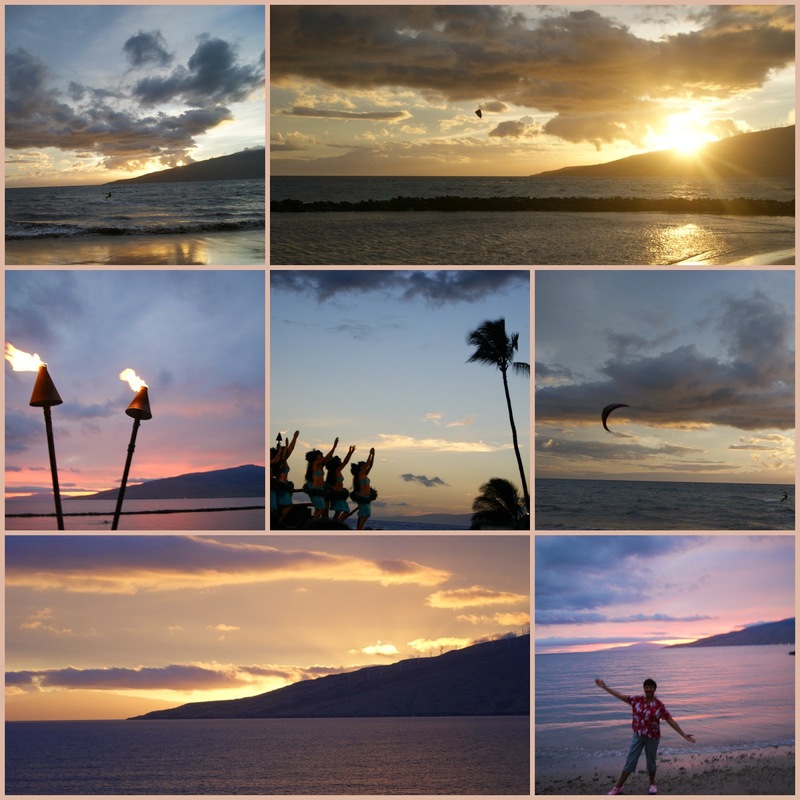 and put on your Hawaiian Aloha wear. 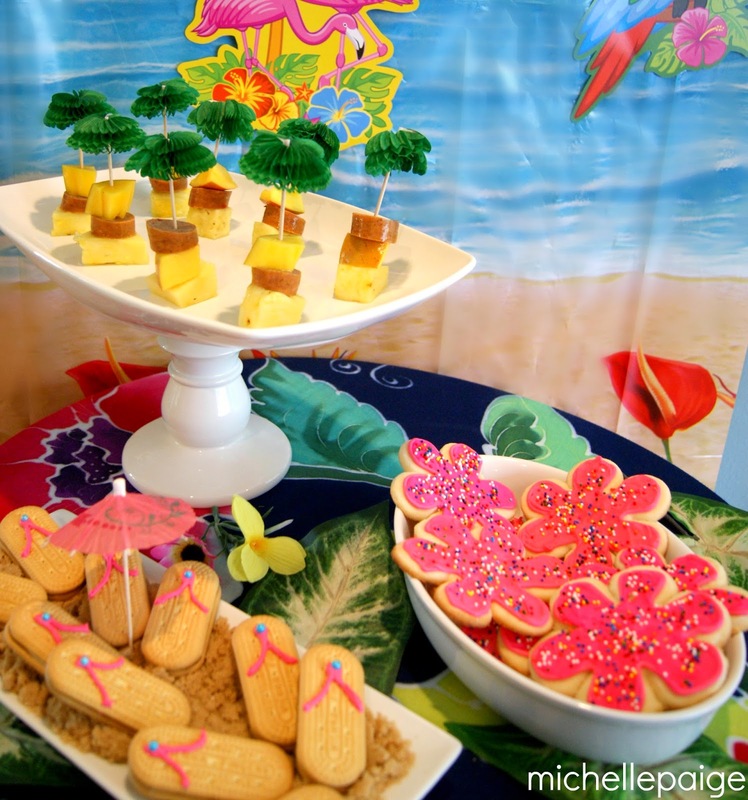 There are so many great Hawaiian party supplies found at the Dollar Store and your local party stores, that one needs to be careful not to overdo it. Unless one likes to overdo. I sometimes like to overdo. My mom's birthday sometimes causes me to overdo. 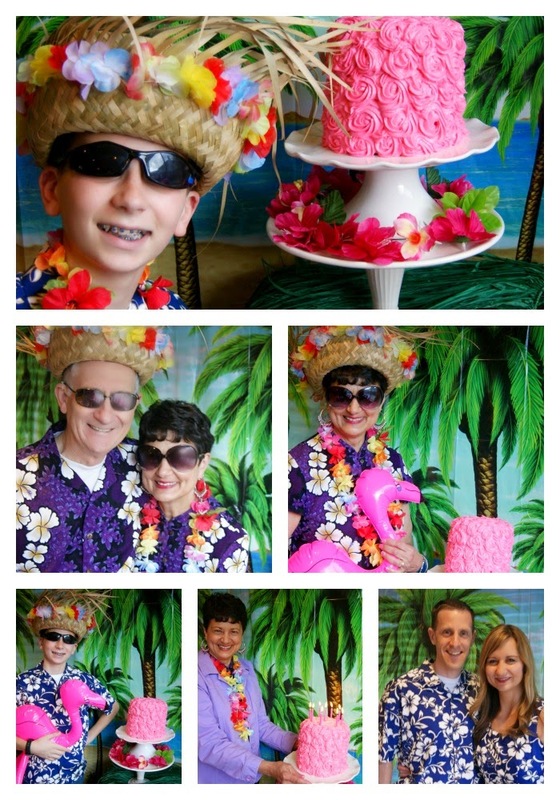 One of my favorite 'over-the-top' party supplies are printed plastic backdrops. 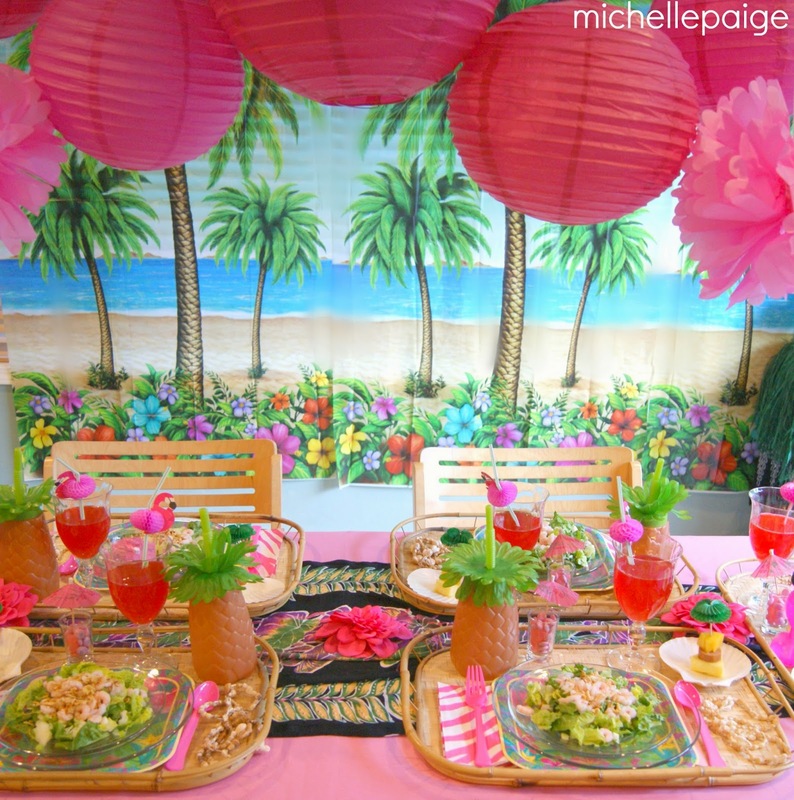 Hang a few plastic sheets of palm tree and ocean backgrounds and it's an instant CrAzY party! Bunches of paper lanterns and tissue paper flowers always add life to a party. 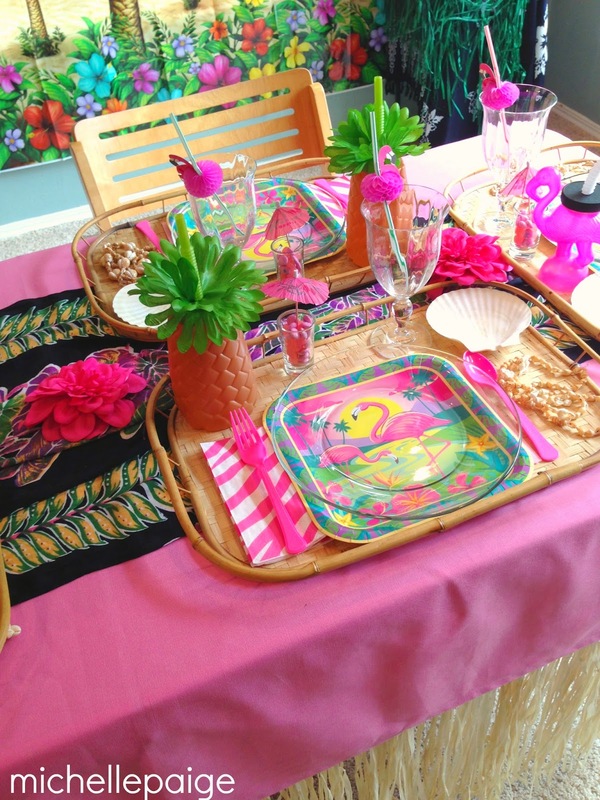 Grass skirts taped around the table add to the tropical look. 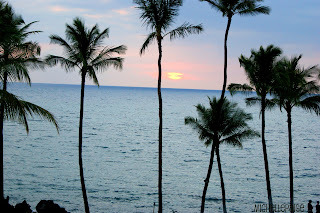 Hawaiian sarongs make the perfect table runners. 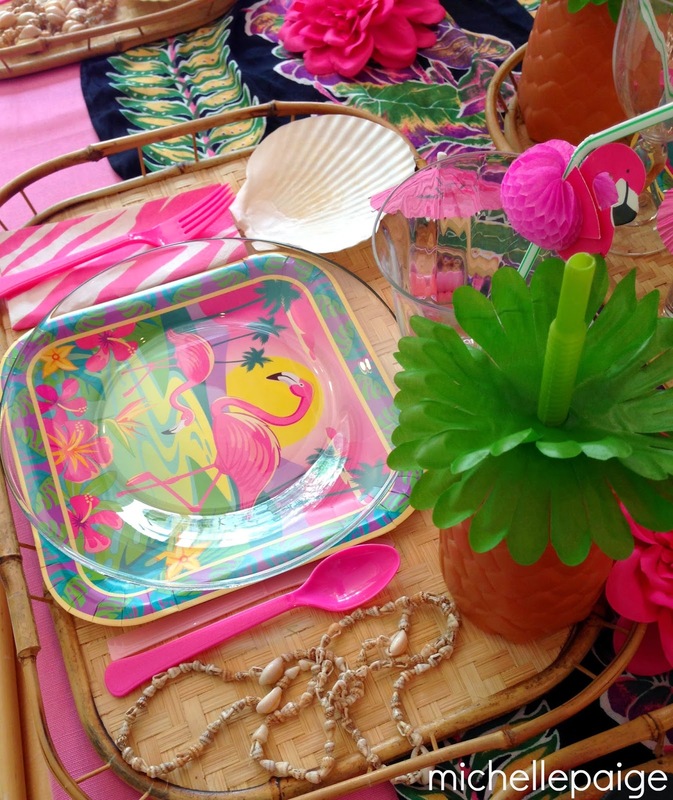 Bamboo trays and shell necklaces and shell plates continue with the theme. I like to place glass plates on top of my paper party plates. This makes for easier eating and still gives off pretty color. 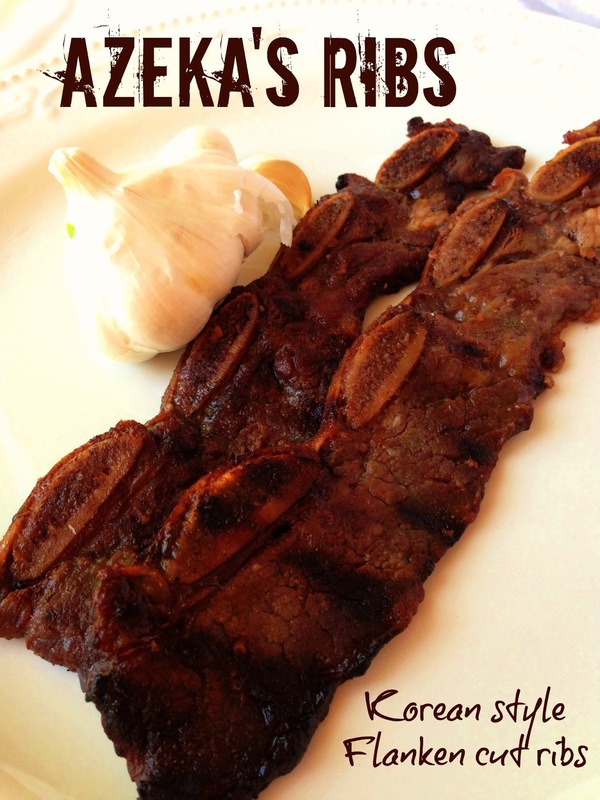 After the meal, clear the glass plates and serve dessert directly on the paper plates. 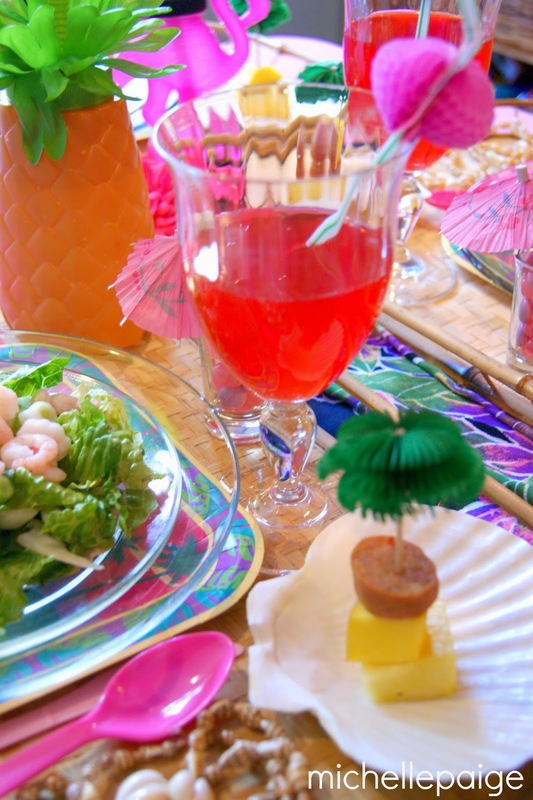 Honeycomb toothpicks and straws give the party a beachy vibe. 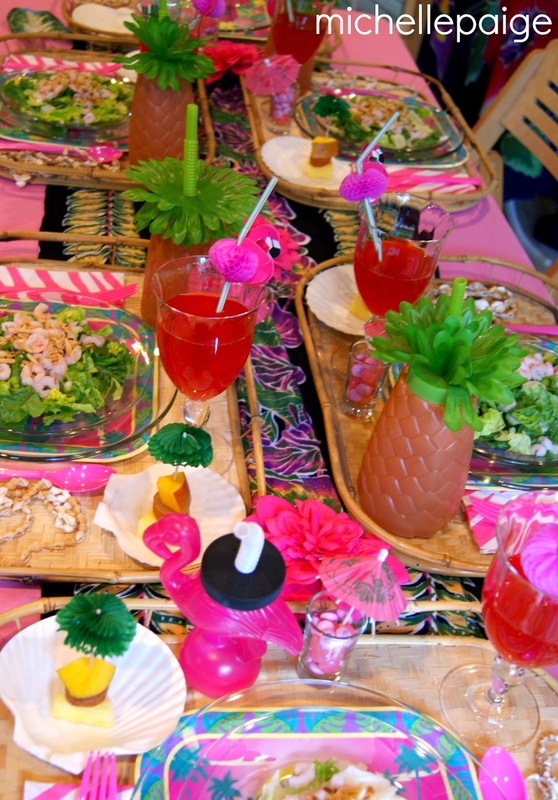 Pineapple and pink flamingo water bottles take the table to a whole new level. 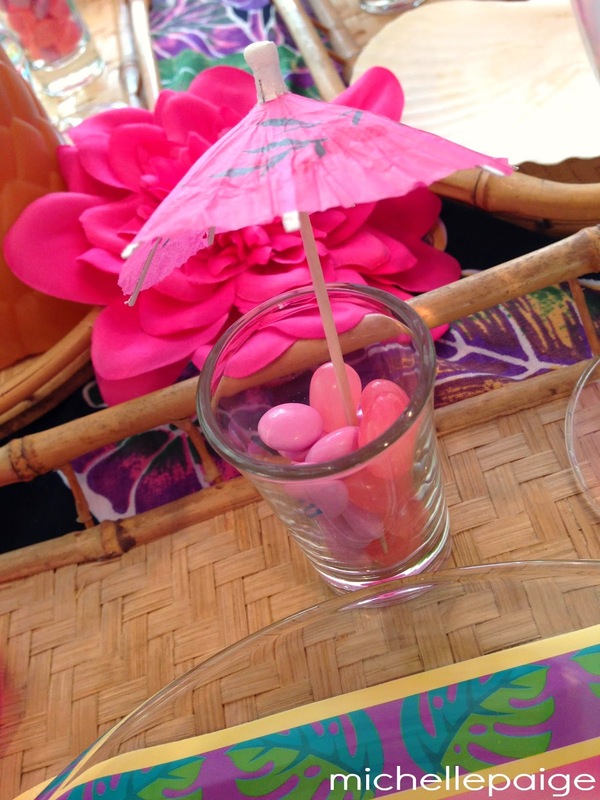 Not to mention the pink umbrellas in the candy shot glasses. This party is not for the timid. 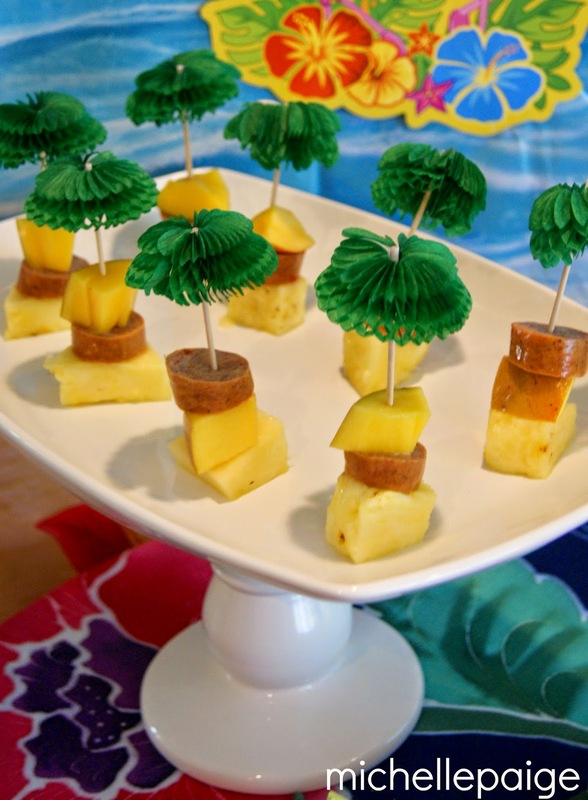 Appetizers of stacked pineapple, mango and chicken sausage bites look festive on platters. 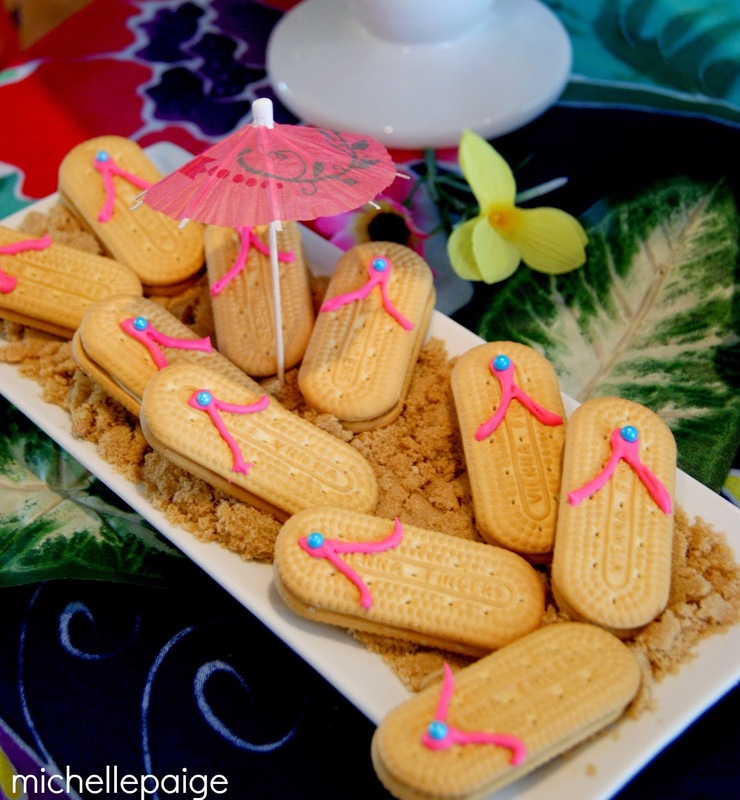 -Vienna Fingers cookies make perfect flip flops. Add a bit of frosting, a sugar pearl and place them on a platter of brown sugar 'sand'. -Pink floral sugar cookies carried the theme, too. 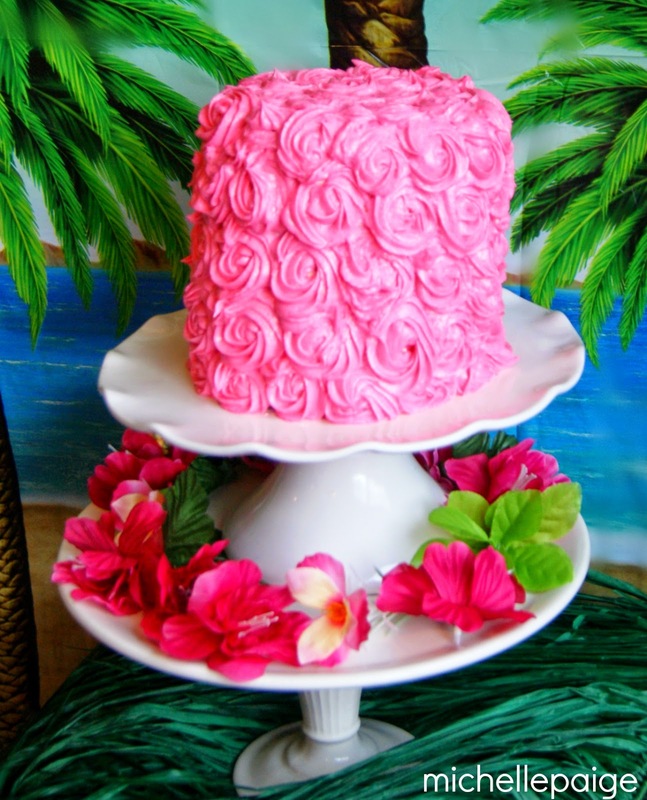 Just a triple layer, chocolate cake with coconut & macadamia nut filling with buttercream frosting. Click here to see how incredibly easy it was to frost this cake. You won't believe it! 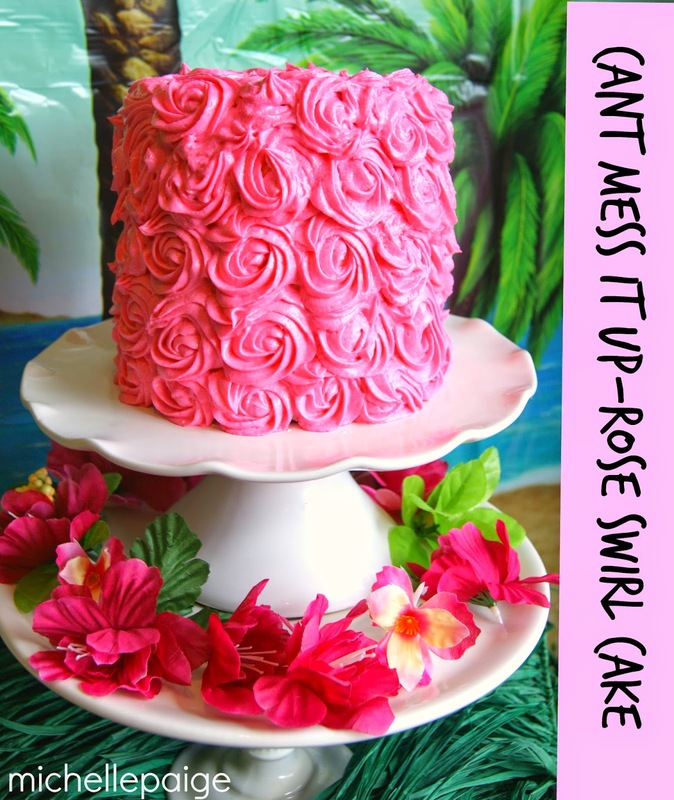 You can't mess it up...really! And, if you're going to have a party like this, you must have a dress code! Don't forget to stage a photo shoot! 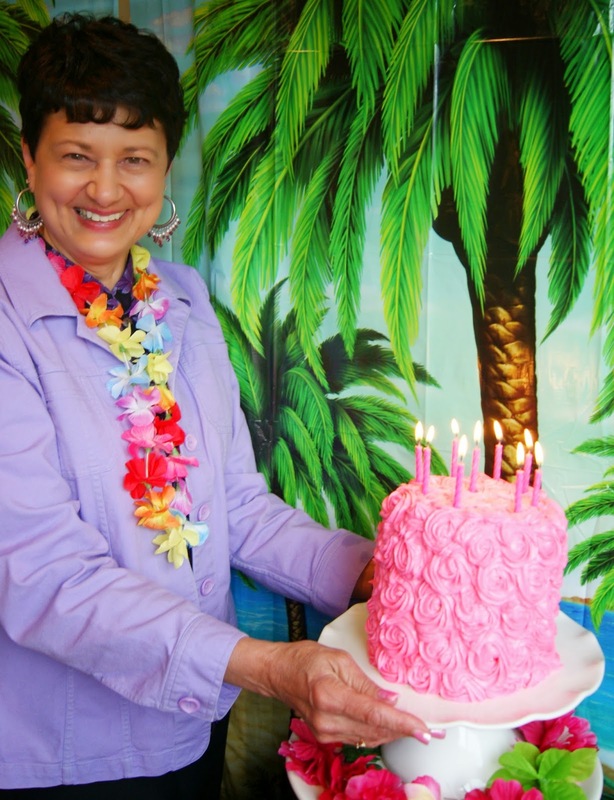 Hawaiian hats, leis and pink flamingos just add to the craziness! The plastic party beach scenes are the perfect backdrops for pictures. 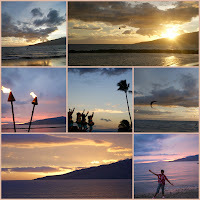 Add in some Hawaiian music, hula and limbo to spice things up. I LOVE your party!!! Very festive...hope mom loved it too!!! Thanks! Yes, mom loved it! 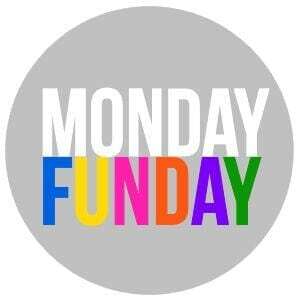 How fun and cute! 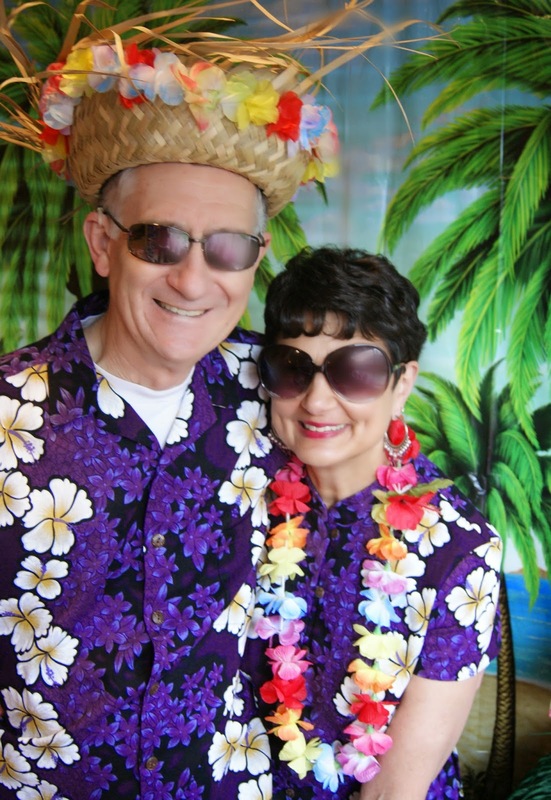 You know I love the Hawaiian theme! :) Looks like it was a lot of fun. Thanks, Sharon! I always love a Hawaiian theme.